Denver Water recycled water for the Rocky Mountain Arsenal? CDPHE says not so fast. Even with Colorado’s push to rely more on recycled water, the Rocky Mountain Arsenal National Wildlife Refuge will spend another summer using millions of gallons of Denver’s drinking water to fill lakes and irrigate fields after a recent decision by state health officials. Federal wildlife biologists calculate they’re drawing more than 82 million gallons of Denver drinking water a year to fill three once-toxic lakes at the refuge, formerly a nerve gas and pesticides plant that became an environmental disaster. But the Colorado Department of Public Health and Environment last week reaffirmed its position that the refuge must go through a process of proving why it should be allowed to use water that is not as clean and submit to an Environmental Protection Agency review. A $2.1 billion cleanup of toxic pollution included restoration of the lakes for catch-and-release fishing and to store water, which wildlife managers use to irrigate the 27-square-mile refuge — habitat for bison and other species. Until the drought of 2002, High Line Canal agricultural water trickled into the lakes. Groundwater pumping added more water. CDPHE at some point — it was not clear when — reclassified the lakes as water supplies, and refuge managers made a deal with Denver to use drinking water, which started in 2008. Then, in 2009, CDPHE reclassified the lakes as water bodies, meaning “an important social or economic development” reason for allowing lesser-quality water must be demonstrated. State officials, on an emergency basis in May 2013, agreed to remove the water supply classification on the refuge lakes but still require the proof of a public purpose before water quality can be reduced. Frustrated refuge managers, backed by Denver Water and the Denver Museum of Nature & Science, have been pressing to use recycled water and putting in the plumbing to do so. Denver Water has spent more than $197 million installing a citywide 80-mile network of pipelines that distribute partially treated recycled water to parks, golf courses and the Denver Zoo. The museum uses recycled water in its new heating and cooling system. All sides agree that using more recycled water is a priority. But CDPHE Water Quality Control commissioners on May 13 voted 5-4 to reject a request to reconsider — so the refuge must go through a “necessity of degradation demonstration” review to be able to use recycled water. U.S. Fish and Wildlife Service managers of the refuge say the analysis for the review would not cost much but would require spending $10,000 to $15,000 a year more for water monitoring. They said new analysis would have to be done every three to five years, tied to permitting, creating uncertainty because state officials could ask for operational and infrastructure changes during reviews. Lucas said even if they were to have something to present by the June commissioners’ meeting, it would be October at the earliest for the water switch if everything was approved. Denver Water officials have been working aggressively since 2004 to increase use of recycled water, saving 7,000 acre-feet of drinking water a year, utility recycled water director Jenny Murray said. Denver Water attorneys in a May 6 letter to CDPHE argue that state lawmakers have ordered efforts to “encourage the reuse of reclaimed domestic wastewater.” Denver Water contends CDPHE decisions undermine state policy, waste public resources and defy common sense by imposing a needless bureaucratic burden. One of Denver’s new recycled water pipelines runs by the Denver Museum of Nature & Science to the refuge. A steady, year-round flow of recycled water in that pipeline is required to ensure sufficient flow to run the museum’s innovative new geothermal heating and cooling system, which was funded by a federal grant to boost energy efficiency. “When we designed our system three to four years ago, both Denver Water and the refuge folks felt that obtaining a permit to discharge recycled water into the lakes at the refuge would not be a problem,” said Dave Noel, museum vice president for facilities, capital projects and sustainability. CDPHE’s stance “has got all of us scratching our heads,” Noel said. At the refuge, future water needs are projected as high as 456 million gallons a year. Beyond Denver Water, wildlife managers rely heavily on pumping water from underground aquifers into the Mary, Ladora and Lower Derby lakes — pumping they are trying to reduce by using more recycled water, which is cheaper than drinking water. They calculate the federal water bill could be cut by $30,000 a year. A thriving bison herd is growing, with 11 calves born this spring, pushing the population to 81. An adult bison can eat around 50 pounds of grass a day. A team of biologists recently had to reduce the herd to prevent exhaustion of the short-grass prairie. Plans call for expanding bison habitat to allow a herd of 209 bison, which would roam up to the road to Denver International Airport, where a visitor viewing station is envisioned. Not having reliable recycled water will limit the bison herd and lead to decreased numbers of waterfowl, fish and grassland birds, Lucas said. Lucas remains puzzled by the entire process. Once, homesteading farmers and ranchers lived here. In 1942, the Army established the arsenal to make mustard gas and blister agent to deter Japan and Germany. Then, during the Cold War, factory workers in body suits and gas masks produced thousands of tons of napalm and sarin nerve gas, which was stuffed into bomblets that were placed in Honest John rocket warheads. Army leaders later leased the site to private companies, including Shell, which arrived in 1952 and for three decades produced chemical pesticides, such as dieldrin, that Shell sold worldwide for agriculture. The liquid waste was dumped in evaporation ponds. Solid waste was dumped into trenches. More than 600 lethal chemicals spread through the soil into groundwater. More South Platte Basin coverage here. The U.S. Environmental Protection Agency (EPA) has announced a proposal to delete portions of the Rocky Mountain Arsenal (RMA) from the National Priorities List (NPL). The NPL is a list of the nation’s most contaminated sites, known as Superfund sites. EPA and the Colorado Department of Public Health and Environment have determined that all required cleanup activities are complete in the areas proposed for deletion. EPA is accepting public comments on the Notice of Intent to Delete for 30 days, from June 17 to July 19, 2010. EPA is proposing to delete 2,500 acres of soil, sediment, surface water and structures from the central and eastern surface areas within the RMA boundaries. EPA is also proposing to delete the entire surface area just north of the RMA boundary. Groundwater underlying these areas is not included in this deletion and will remain on the NPL. All areas at RMA deleted from the NPL will continue to be subject to regular EPA review to ensure the protection of human health and the environment. Deleting property from the NPL facilitates reuse of that property. Should the proposed deletion of the central and eastern surface area be finalized, its 2,500 acres will be transferred to the U.S. Fish and Wildlife Service (FWS) to become part of the Rocky Mountain Arsenal National Wildlife Refuge. This is the fifth proposed partial deletion of land at RMA. Between 2003 and 2006, EPA completed four partial deletions consisting of 13,406 acres. 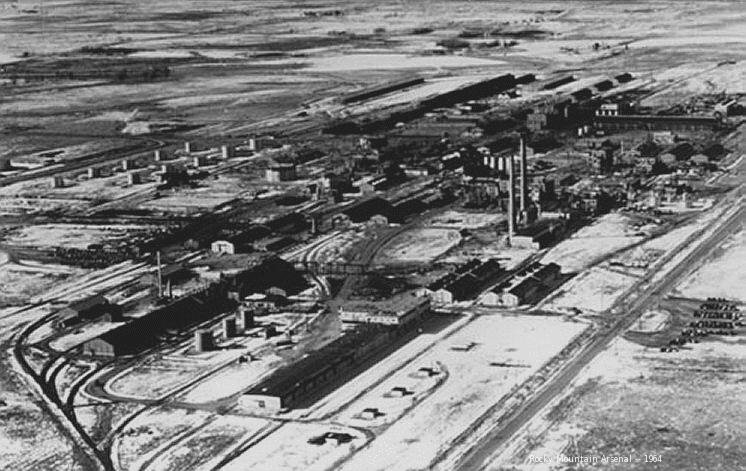 Of the property deleted at RMA to date, 917 acres were sold to Commerce City for commercial development, 12 acres were transferred to South Adams County Water and Sanitation District for the Klein Treatment Facility, 126 acres were transferred to local governments for road-widening, and 163 acres were retained by the Army, primarily for water treatment systems. Another 12,188 acres were transferred to the FWS to become part of the National Wildlife Refuge, as prescribed in the 1992 Rocky Mountain Arsenal National Wildlife Refuge Act. RMA is located in Commerce City, approximately ten miles northeast of Denver, Colo., in Adams County. RMA was established in 1942 by the U.S. Army to manufacture chemical warfare agents and munitions for use in World War II. Beginning in 1946, some facilities were leased to private companies to manufacture industrial and agricultural chemicals. Shell Oil Company, the principal lessee, manufactured pesticides at the site from 1952 to 1982. Industrial and waste disposal practices resulted in contamination of structures, soil, surface water and groundwater. EPA placed RMA on the NPL in 1987. Since that time, the site has been undergoing extensive environmental investigation and cleanup.